The Plantronics Voyager Focus headset checks all the boxes, from modern Bluetooth stability, intuitive headset controls, and rock solid call clarity. If you’re looking for a fully-featured Bluetooth headset, and you don’t want to make any compromises, the Plantronics Voyager Focus UC is going to fit the bill. This on-ear stereo headset works just as well during conference calls as it does for casual music listening, which is much more than you can say about most mono headsets. There’s active noise canceling, a super-clear boom mic, nice fit-and-finish features like memory foam ear padding, and a good spread of accessories. You will pay a premium for it, but if you’re shopping in this category, you probably already know that. Let’s break down everything this powerhouse has to offer. Like the Voyager 5200, the Focus UC has a really interesting design, especially considering the other headsets on the market. Usually, a headset that’s focused on business calls sticks to blacks, grays, and silvers. While Voyager Focus does lean heavily on this color scheme, it folds in some interesting pops of red both in the headband elastic as well as underneath the mesh holes on the ear cups. It seems like a bit of an odd choice for an office peripheral, but this tells us that Plantronics is not afraid to let their products lean a bit in other directions. The ear pads themselves are just under 3 inches in diameter, and the plastic silver boom mic is also just under 3 inches. The headband is constructed of two sturdy plastic bases and a bare metallic arch going over the top of your head. Underneath that is an elastic-supported head pad that comes together with those interesting red accents we mentioned. Even the case carries through the color scheme with a red zipper. All in all, it’s a refreshing design for this category and we think it’s a real selling point. This on-ear stereo headset works just as well during conference calls as it does for casual music listening. We were very pleased to see that Plantronics pulled no punches with the construction of this headset. The headband bracing is a very rigid, largely immovable steel arch, and the elastic/leather/foam headrest feels pretty substantial, too. Considering this is one of the most common places a headset fails, it’s nice to see that Plantronics has sprung for high-quality components in this point. 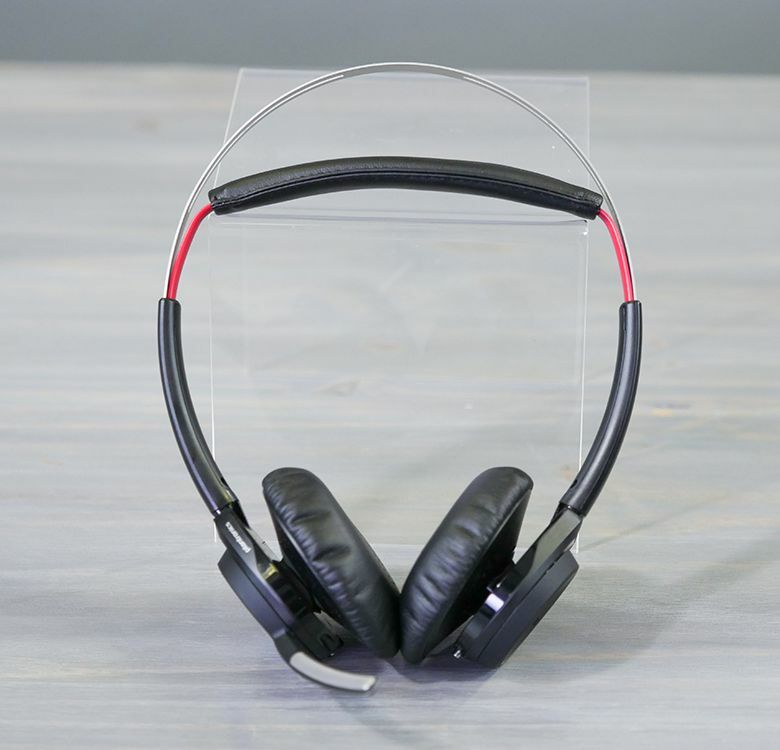 The swiveling ear cups are a little on the loose side, which leads to ease of motion, but does seem like they might wear out even more over time. The accessories are also pretty solid, with a thick rubber-based stand that sits firmly on your desk and a padded travel case. Considering many of these headsets don’t come with any accessories, it’s nice to see. Another thing to note is that there isn’t any advertised water or dust resistance, which shouldn’t be too much of an issue in practice because this is an office headset. We’ve tested a few headsets in this category, and whether they’re single-eared mono headset or stereo devices, the comfort level was always a point of contention. If you’re using your headset to hop on sales calls all day, they should be comfortable. The thick layer of memory foam on the Voyager Focus made them decidedly easy to wear for long periods, and because they are on-ear, no over-ear pads, there wasn’t a whole lot of overheating. We were surprised at how few of these business headsets command comfort. The thick layer of memory foam on the Voyager Focus made them decidedly easy to wear for long periods, and because they are on-ear, no over-ear pads, there wasn’t a whole lot of overheating. The headband on top has its own layers of leather and memory foam, and because it’s supported by an elastic band, it rests pretty nicely right on top of your head. Plus, at 5.5 ounces, the weight isn’t too cumbersome, though we’d have preferred it just a bit lighter. With drivers as big as these, we weren’t surprised that the sound quality was better than your average call center headsets. What did surprise us was just how full the spectrum felt. The sound response was obviously not as great as you’d get from dedicated music headphones, but it was a good deal better than other call headsets, with a good amount of bass and rich response in the key vocal frequencies. Naturally, you can hear phone calls well on this headset, but with a three-mic array that aims to optimize your voice through background noise, the speaking quality was pretty great to hear, too. What’s interesting is that Plantronics has decided to go with a three-mic system rather than the four-mic system found on the less expensive, single-ear Voyager 5200. We found that the call quality was really great, but perhaps not quite as pointed and directional as on the 5200. Finally, with fairly decent active noise canceling, it was easy to zero in on the speaking voice, even in noisier office or outdoor environments. Because the rest of the features on this headset are so premium, we were hoping for 15–20 hours of battery life on a single charge (that’s the low-end estimate of premium Bluetooth music headphones). Plantronics clocks the talk time at 12 hours, and closer to 10 when you have the active noise canceling on. If you’re just listening you can get up to 15 hours on a single charge, but realistically, you’ll be doing some calls on this, so the working hours are closer to 10–12. In our tests, we were getting closer to 10 hours, so it’s safe to say that you’ll need to charge these a fair amount. What’s great is that Plantronics includes a premium charging dock with the package we got, and there’s an additional micro-USB charger too. This means you won’t need to bring the charging dock on the go with you, though there’s a nice traveling case if you’re on a business trip. This versatility is really nice to see for the price point. Like other units on the premium end of the Plantronics line, the controls on the Voyager Focus UC are real standout features. There’s a huge spread of options: first, the volume is controlled by rotating the left earcup forward or backward, which makes it really easy to adjust quickly. There are pause, play, and skip controls on this same earcup. On the other ear cup is a giant Call Answer button. The On/Off toggle switch doubles as the Bluetooth pairing switch just by holding the toggle in the opposite direction. There’s also an Open Mic/Mute button that allows you to mute your voice on-demand when you’re on a call. What’s great about this is that the headset will use smart sensors on the speaker to recognize whether you put the headset down or not, and will toggle the mute for you automatically. It even beeps at you if you try to talk when it’s on mute. The controls on the Voyager Focus UC are real standout features. The Bluetooth 4.1 connectivity on these headphones was rock-solid in our tests. That protocol means that you’ll have about 98 feet of range from your Bluetooth device—way more than you’re likely to actually need in practice. There’s A2DP headset protocol, and you can even download some accompanying apps to further customize the controls based on your connected device. In general, the headset worked well with our Bluetooth devices, but there’s an included USB dongle that allows it to work with non-Bluetooth devices. We found the sound quality to be somehow better when we defaulted to using the USB dongle. And because the headset is designed with cross-device compatibility in mind, it should fold into your environment really well. Plantronics’ MSRP is $299.99, which is way too much for a headset with this narrow focus. At the time of this writing, it’s about $160 on Amazon, which is still a lot of money for a business headset. The noise-canceling is a nice feature that isn’t normally seen on these headsets, and the impeccable amount of onboard controls make it worth it for specific users, but only if you can stomach the price tag. The Jabra Evolve 75 is arguably the only real competitor in the field, as Jabra and Plantronics are the two main brands that have headsets within this price point. For the most part, the Jabra offers some interesting visual features and workflow additions, while the Plantronics seems a better value with clearer call quality. The Jabra Engage 65 is a slight step up with a fantastic Bluetooth range (about 100 feet) and a really premium build, but it comes with a high MSRP as well. Need some more help finding what you're looking for? Read through our best Bluetooth headsets article. The price is worth it if you're looking to invest in business calls. The Plantronics Voyager Focus UC provides really great connectivity, clear call quality, and a solid integration into your workflow with smart, innovative controls and sensors. For more casual hands-free phone calls, there are plenty of cheaper options. Product Dimensions 5.4 x 3.5 x 6.1 in.